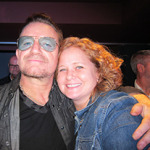 I stumbled upon some of my most favorite U2 tracks back in the early aughts, when Napster ruled and music was free and easy and yours for the taking — and I took, because I was a college student and that justified being cheap and breaking the law. These were songs not on the studio albums or singles, and all of a sudden, I had a way to access them. These rarities are what we U2 fans use as a litmus test on other fans we meet. “Dreaming With Tears In My Eyes” and “Slide Away” are like our secret handshake. If you’ve heard these, you’ve proved you’re worth your salt. When U2 released the remaster of The Unforgettable Fire in October 2009, I heard for the first time “Sixty Seconds In Kingdom Come,” a b-side from “The Unforgettable Fire” single (released in 1985). It was another instrumental, whose sound reminded me a lot of “Montgomery’s Visit,” but it was still frustrating for me that this music didn’t really have a home. With the 20th anniversary super-mega-special editions of Achtung Baby, U2 are releasing a whole lot of content — some we’ve heard before, some we could swear we’ve heard before, and some we’ve definitely never heard before. Today, while listening to Kindergarten, an alternate version of Achtung Baby that presents the 12 songs in early, unfinished forms, “Montgomery’s Visit” finally made sense to me in the U2 oeuvre. My heart jumped and my eyes went wide as, one second into the infant version of “Tryin’ To Throw Your Arms Around the World,” Edge’s guitar scratches gave way to the familiar melody that has floated around my head for a decade. “Montgomery’s Visit” is a song I’ve listened to a lot over the years; it’s the sixth most played song in my U2 music library. It’s inherently lovely, but carries with it much associated meaning and many memories for me, as songs are wont to do. Hearing its place in “Tryin’ To Throw Your Arms Around the World” was a little Eureka! moment on my morning walk. It was like I’d solved a mystery; I’d finally figured out whodunnit. And while it’s interesting to hear “Montgomery’s Visit” paired up with some lyrics, and to understand its relevance as an exploration for the band, this early iteration has a folksy feel that I’m glad the song didn’t become. For me, “Montgomery’s Visit” still holds its own as a sweet, Southern instrumental. But I’m happy to know where it came from. You have good pen, you’re able to keep the subject clear even if you put in a lot of information that is not revolving exactly around the main point. Montgomery’s Visit (what a strange title) is one of those pieces that haven’t sunk in with me yet. Maybe it’s a grower.